WASHINGTON -- The shrinking space on airplanes is surely uncomfortable, but it might also be dangerous for passengers' health and safety. Planes are filled with more passengers than ever before. Fliers are older and heavier. Flight attendants warn about an increase in air rage, and experts question if having rows of seats packed closer together might make it harder for passengers to evacuate after a crash. A consumer advisory group set up by the Department of Transportation dove into all those issues Tuesday at a public hearing as part of its role to make non-binding suggestions to government regulators. Charlie Leocha, the consumer representative on the committee, said the government sets standards for the conditions for dogs flying as cargo but doesn't dictate minimum space standards for passengers. "In a world where animals have more rights to space and food than humans," Leocha said, "it is time that the DOT and FAA take a stand for humane treatment of passengers." Questions were also raised if the increased density of seats means passengers won't be able to evacuate fast enough after a crash. The Federal Aviation Administration runs various tests including how fast passengers can evacuate a plane and how fast they can put on a life preserver. But Cynthia Corbertt, a human factors researcher with the FAA, testified that it conducts those tests using planes with 31 inches between each row of seats. Many passenger jets today have less legroom. For instance, United Airlines has 30 inches of room, known as pitch, on some jets; Spirit Airlines offers 28 inches. "We just haven't considered other pitches," Corbertt told the Advisory Committee for Aviation Consumer Protection. Before any new jet is allowed to fly, the manufacturer must prove that everybody can evacuate in 90 seconds with half of the exits blocked. Carry-on baggage is strewn throughout the cabin, and the test is conducted in night-like conditions. However, the cabin is not filled with smoke, and all of the passengers are physically fit, dressed in athletic clothing and know that an evacuation is coming. Pennsylvania Attorney General Kathleen Kane, who chairs the DOT committee, noted concern that the FAA does not factor in human panic, especially parents who might take extra time to ensure their children are safe before evacuating. "So they aren't the average traveler, quite honestly," Kane said. Nimia L. Reyes, a medical officer with the Centers for Disease Control and Prevention, said that seat size isn't necessarily a factor in people developing the clots or not. The real issue, she said, was how able passengers are to get up, walk around and stretch. Those in window seats have twice the risk of getting deep vein thrombosis than those on the aisle seats. Producing more legroom isn't that simple. After years of major losses and a wave of bankruptcies, airlines are finally profitable again after adding baggage fees and increasing the number of seats on jets. Last year, U.S. carriers earned more than a combined $11 billion. Airlines do offer coach passengers more legroom, if they are willing to pay for it - often $50 extra each way. Many travelers aren't. Keith Hansen, director of government affairs for budget carrier Allegiant Air, said the No. 1 thing vacationers care about is price. "The only way we can offer a low airfare ... is to increase the seating density so we can divide the cost of operating a flight among the greatest number of people possible," Hansen said. The DOT has seen an increase in passenger complaints but few regarding seat recline or personal space, said Blane Workie, a committee member and the department's assistant general counsel for aviation enforcement and proceedings. David A. Berg, a member of the DOT committee and general counsel for the airline industry's trade and lobbying group, Airlines for America, asked how airlines would respond if the government created a new rule requiring a minimum amount of legroom. 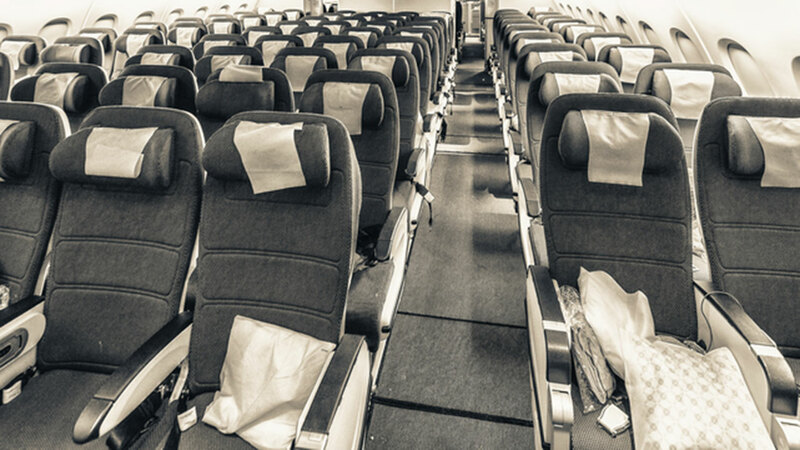 "If airlines are forced to reduce the number of seats," Hansen replied, "inevitably there would be an increase and it would price out part of the traveling public."